Helps support bone density, overall cardiovascular health, nerve health and muscle function. 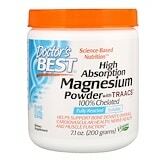 Doctor’s Best High Absorption Magnesium Powder with TRAACS 100% Chelated is a patented, organic form of bio-available magnesium, it is not buffered and more absorbable than magnesium oxide. Magnesium is an essential dietary mineral that is required for optimal function of the cardiovascular system, the nervous system, skeletal muscle and digestive tract. Helps support bone density, overall cardiovascular health, nerve health, and muscle function.